Hurricane Florence crossed onto land 300 miles south of the Outer Banks this morning, and the expansive storm continued throw some squalls and high surf onto the shoreline up to the Virginia line and beyond. 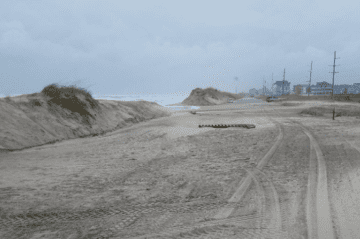 Hatteras Island is still shut down, but with flooding and damage minimal above Oregon Inlet, Dare County officials said in a statement this morning that they expect to start a phased re-entry onto the northern beaches Saturday morning. Meanwhile, towns on Hatteras are flooded, however, and N.C. 12, the only access to the island, is closed. Water rescues were under way in historic New Bern, an inland town about 145 miles from Nags Head. This morning, the National Hurricane Center said that the center of the storm was about 130 miles southwest of Buxton and heading west-northwest at 6 mph. 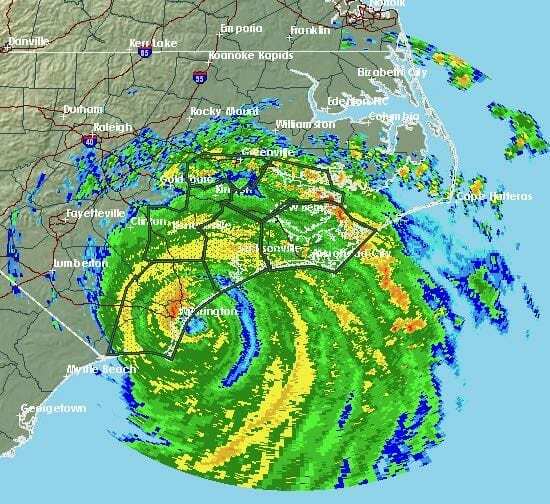 Maximum sustained winds were 90 mph, which will remain far south of the Outer Banks as the storm makes landfall today somewhere around Wilmington, N.C.
Florence is about 400 miles wide, with tropical storm force winds of at least 34 mph radiating 195 miles from the center and hurricane winds of 74 mph or more, 80 miles. The local resident worker whom you empathize with are fortunate to 1]have a home to come back to and 2] a job to come back to. Many in Eastern North Carolina have neither. And I heard not one local weather forecaster be so irresponsible to suggest that this storm did not have the potential to be catastrophic. And it was catastrophic, just not for the northern outer banks. Be thankful. Yeah ! What Dylan said. This has been a fiasco by the local officials. I feel for the local resident worker who left the beach, lost a weeks worth of pay, spent hard earned money on hotels, gas and food. Again there were local weather people saying it was not going to be anything like the past famous storms and to ignore those suggesting that. The doomsayers won out though. I am appalled at those who can only think of their lost rental revenue. Safety first, not the almighty dollar. Think of others, such as first responders who put their lives at risk because of foolish demands. And the predictions were far from what happened. This storm consistently fooled the forecasters for 8 days. An abundance of caution was appropriate and should be applauded. This article addresses permanent residents and then visitors in duck . It says nothing about non resident homeowners,the other type of re entry pass, , so when can I come? Non-resident property owners are also included in Saturday’s reentry. Inadvertently left out of the story. @ runnerguy45 Hatteras is part of dare county. How else would you induce the visitors to leave? You cannot evacuate the permanent residents of dare in 24 hours, much less an additional 100,000 to 150,000 visitors. What would be your plan, since apparently you know better than everyone else? Oh BTW, don’t leave O-coke out of your evacuation plan, as a south and west escape route would not have been advisable either. Actually, schools closed and evacuation was ordered on Hatteras Island on Monday am. That really was too early given the forecast that existed at that time. Once the storm turned south and went from Cat 4 to now a Cat 1, the early action appeared ill advised. Of course, Dare Co. and the governor can’t predict the weather, but being overly cautious in this case will cost the residents of Hatteras Island a lot of much needed business. I work for Midgetts cleaning service can I get on the beach tomorrow to go to work?? They absolutely did the right thing by restricting access. This storm was very unpredictable and even the National Hurricane Center stated that was the case. It was supposed to turn out to sea on the other side of Bermuda…it didn’t. It was supposed to turn between Bermuda and US coast. It didn’t. Now it is expected to move southwest, which is extremely rare for an east coast hurricane. Tourists get themselves into trouble because they don’t know or understand. And it takes a long time to evacuate Hatteras and must be done before conditions prevent it. Without full access to hwy 12 and essential personnel, how are we supposed to get the rental houses unprepped and ready for new guests? Not smart! No one is getting south of Oregon Inlet at this point, and there is no date for when it will open to residents, personnel or visitors. Only north of Oregon Inlet is opening on Sunday. The storm was supposed to hit on Thursday evening. Better to act early than to be too late. The County’s crystal ball did not tell them the storm was going to turn south and west. Don Slater is a hack. Article says perhaps Sunday 7 am, Karen. Dare County should NEVER have acted so early. This is beyond ridiculous ! Don Slater weatherman on WAVY 10 was saying were not getting anything too bad. Why did the County officials feel the need to act Tuesday for a storm that wasn’t supposed to hit till Saturday ? This was a big nothing !! Dare County officials said in a statement this morning that, for now, the mandatory evacuation order will stay in place. They are evaluating areas north of Oregon Inlet. “Starting this morning, damage assessment teams will be working to assess conditions and re-entry guidelines will be established once conditions are deemed safe,” the statement said. has Wright memorial bridge reopened?